Life In Dogs: The homeless & their pets... And the organization that wants to help. The homeless & their pets... And the organization that wants to help. Every person, whether two- or four-legged, needs a home. But for four-legged ones, "home" is—quite literally—where the human is. And what if your human doesn't have a home of his/her own? You see them often, everywhere. 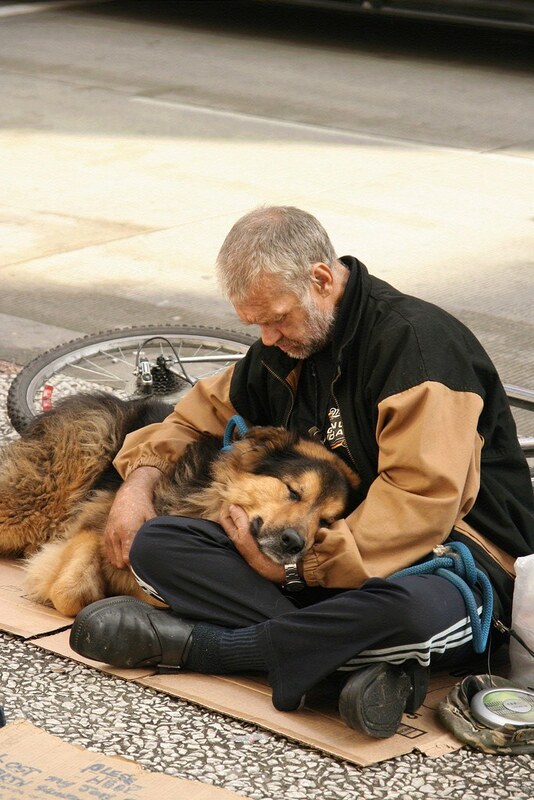 Homeless people with animals. What little they have, they share with that dog or cat (or bird, or...). Often they'll go without food themselves in order to feed their companion. It's not an ideal situation for either of them, but it still warms my heart to see it: these bonds of love between two homeless beings. How wonderful that hey've found each other. That generosity of spirit exists even in the most desperate of circumstances: in the human with nothing, in the animal who's been abandoned and mistreated and has no reason to trust a single human being ever again. 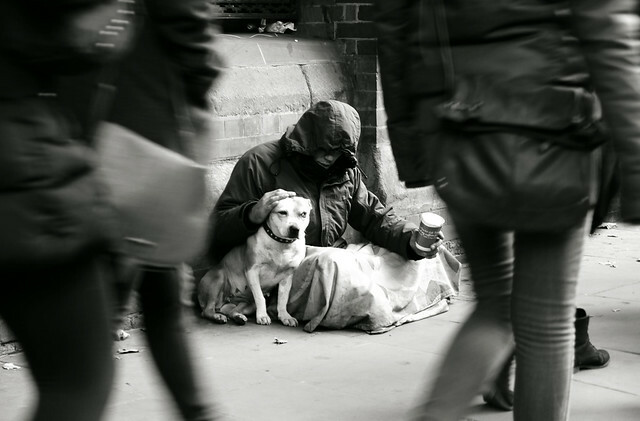 As generous as the homeless human may be, however—as willing as s/he may be to sacrifice him/herself in order to provide for the animal (who, by the way, is even more helpless than the human)—there are things that will be forever out of reach. Affording a vet, for instance. I can't imagine anything more desperate than seeing one of my dogs hurt or sick and not being able to take them to the vet. These dogs (and cats) of the homeless live on the streets; they're exposed not just to the elements but to human cruelty. They can be hit by a car. They can eat poisoned food. They can get kicked, or punched, or stabbed—and their human can do very little to protect them. Besides, they're not getting yearly vaccines. Or a balanced diet. Or tick- and flea-prevention tablets. Or deworming. Or HeartGard. Look at this man. His face is full of love. He'd be heartbroken if something happened to his dog... Especially if it was something that could've been prevented with just a little bit of cash. Pets of the Homeless is an organization that understands this and wants to help. They feed and provide emergency veterinary care for animals whose humans are homeless. Yes, of course the ideal thing is to eliminate homelessness completely—for humans and animals. But that's not going to happen any time soon. Meanwhile, these pets need help that their humans—who love them as much as you love yours, if not even more—aren't, in spite of their most frantic efforts, able to provide. 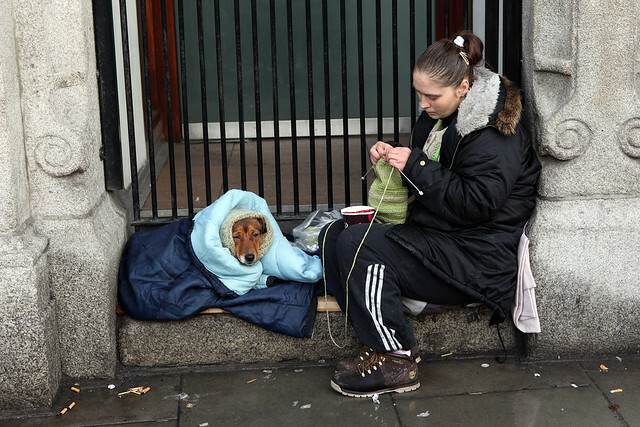 Kudos, Pets of the Homeless. Every nation needs an organization like this. P.S. — If you're as touched by this story as I was, maybe you want to help. You can donate ($50 will provide food and basic vet care for 20 days! ), or find other ways to participate. In the year-end spirit of giving, this seems like a beautiful way to make a difference.